The ferry from Hong Kong to Macau has been an uneventful affair. The hour trip passed without incident and you easily crossed through immigration. As the hordes of Chinese visitors clamour to get aboard buses provided by the casinos, you side-step them and head to the deserted taxi rank. From the ferry terminal at the northeastern corner of Taipa Island, the taxi sets off down the wide new road that skirts what was once the southern coast. To your left, rather than the sea, is a flat piece of reclaimed land that is covered in casinos to sate the gambling fever that has gripped new China. Cotai strip now straddles the two former islands of Coloane and Taipa, making them one super island. Past buildings that have been made to emulate those of Venice, you eventually dip into a more Macanese setting. Your car pulls up at the once coastal, but now land-locked village the island takes its name from; Taipa. Letting you out in front of a roadside shrine to Kwan Kong (關公 Guān Gōng), the god of war, your driver takes his fare and waves you in the direction of an old, ramshackle collection of dwellings. With the wind in your sails, you set about your journey through the old village. The village of Taipa get its name from a Portuguese corruption of the southern Chinese word tiap á (氹仔 dàngzǎi). The word is defunct in modern Chinese, but means pool or cesspit. 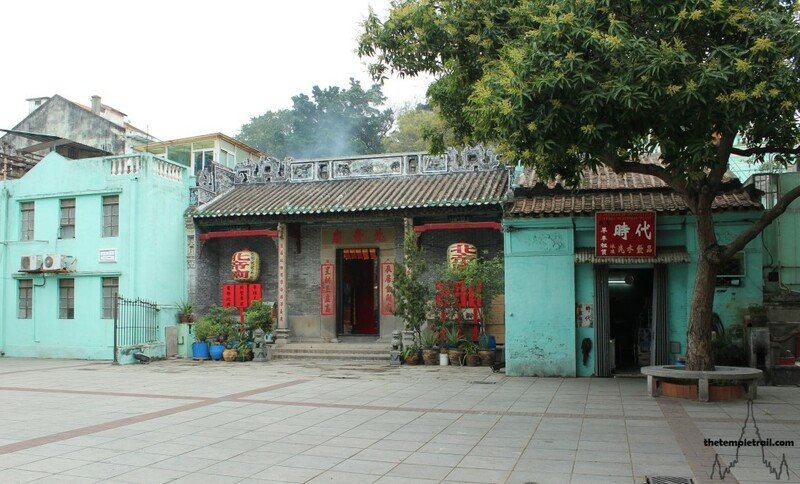 What was once the old village, before the modern concrete buildings began surrounding it, is marked by an old Tin Hau Temple (天后廟 Tiān Hòu Miào). The temple now looks out at nothing, but it originally faced the sea. 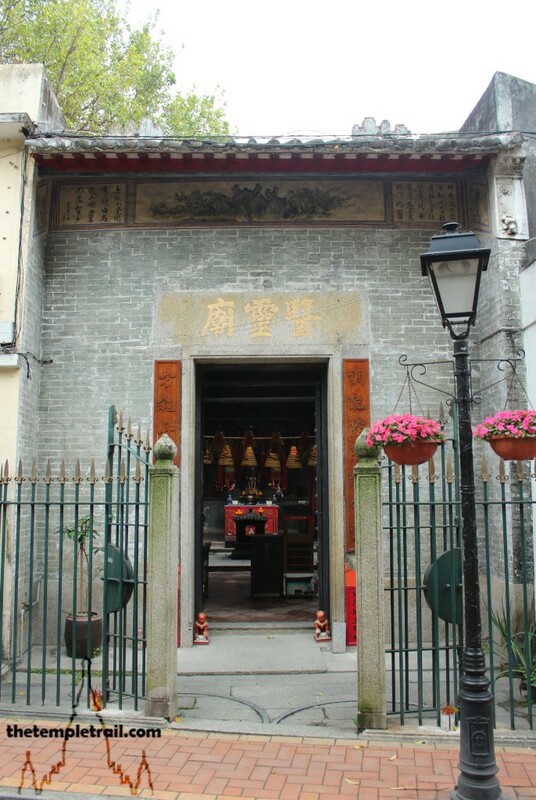 The small, dark temple is the oldest in Taipa and the ancient bell in the temple is inscribed ‘The Tin Hau Temple of Longxing Bay was built in the 50th year of Qianlong Reign’. This means that it was originally built in 1785. In 1833, the Qing Dynasty used the inhabitants of Taipa to attack pirates who were based on the island. So many locals died in the assault, that the government made reparations to the community. Over the following years, this condolence money was collected and supplemented with donations from wealthier local families. The money was then used for an extensive renovation of the temple in 1848, as a memorial to those slain in the battle. The emperor of the time, the Daoguang Emperor (道光帝Dàoguāng Dì), was known for his weakness, and it was during his reign in 1842, that neighbouring Hong Kong was ceded to the British. 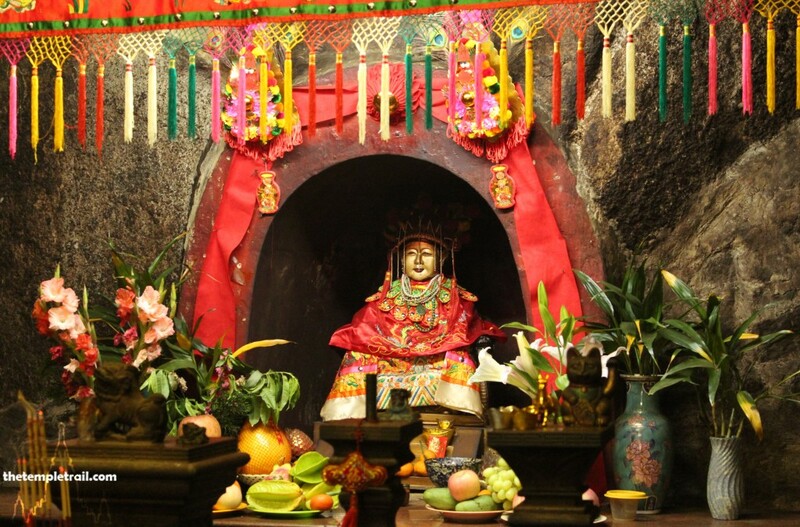 Tin Hau (天后 Tiān Hòu or 媽祖 Māzǔ) is a popular sea goddess and her temples can be found all over this part of the world. Macau has three; another in Coloane and the famous A-ma Temple on the peninsula. 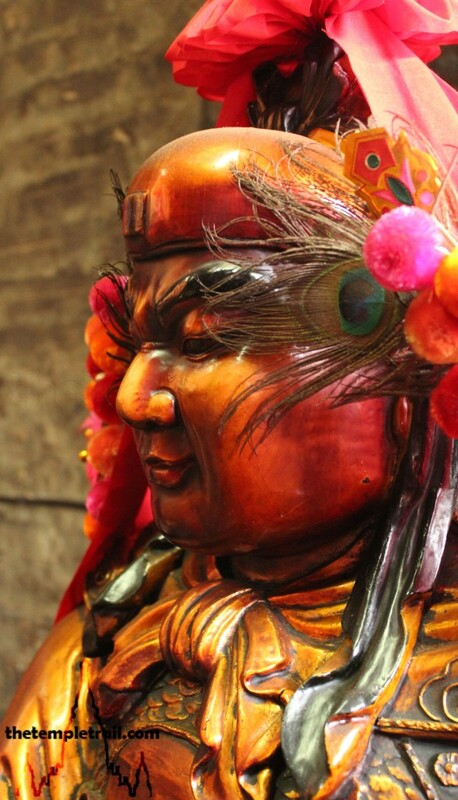 The Divine Empress was born in Fujian Province in the 10th century CE, during the Song Dynasty. Her mortal name was Lín Mòniáng (林默孃) and she was known for helping guide fishermen home by wearing her red dress on the beach. She is said to have saved her father and brother from a typhoon during a dream. She died and became an immortal at the age of 28. Since then, she has been revered as a goddess of the sea and protector of seafarers. Standing before the temple, you see that, due to economic factors, the former hall of the left has been turned into an eating establishment, leaving only the main, central palace. 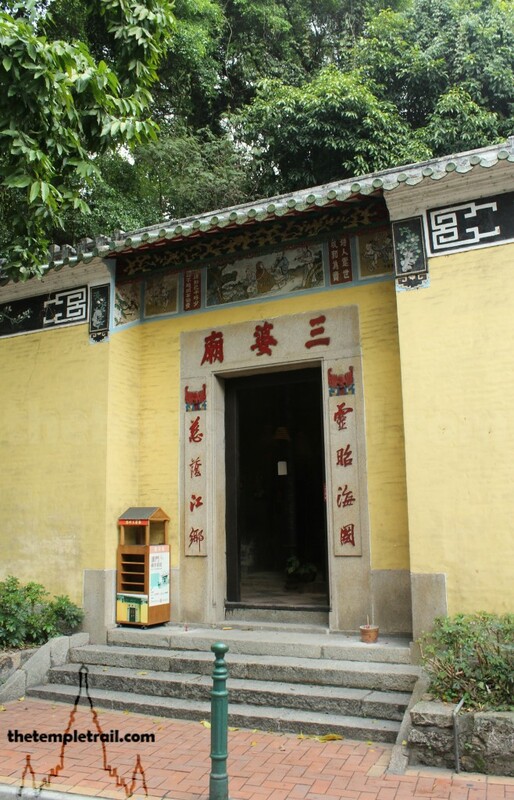 The red frame around the door bears the rhyming couplets (對聯 duì lián) ‘Tin Hau bestows bounties as large as a sea, while dragon surrounds the central seat leaving auspicious air’. This promise draws you in towards the portal and you pass through into the smoke filled interior. The darkened hall is atmospheric and the joss coils lend a mysterious feel to the chamber. Passing the spirit door, you walk to the altar. The offering table is gilded and bears flowers and incense for the goddess’ pleasure. Behind the table is the altar. The seated Tin Hau is dressed in her normal imperial robes. A beaded imperial crown (冕冠 miǎn guān) covers her face, adding a greater enigmatic ambiance to the temple. Staring at the image, you note that her normal retinue is missing. Usually, a statue of Chin Lei Ngan (千裡眼 Qiānlǐ Yǎn – Thousand Mile Eyes) and Shun Fung Yee (順風耳 Shùnfēng Ěr – Favourable Wind Ears) would stand either side of her. Here, she seems to be contentedly safe without her reformed demonic bodyguards. After a few more moments in the shrinking temple, you exit and breathe deep from the fresh air outside. Strolling around the corner, you come to the biggest of the votive structures in Taipa village; the Pak Tai Temple. Pak Tai (北帝 Běidì) is the Northern Emperor or Supreme Emperor of the Dark Heaven. 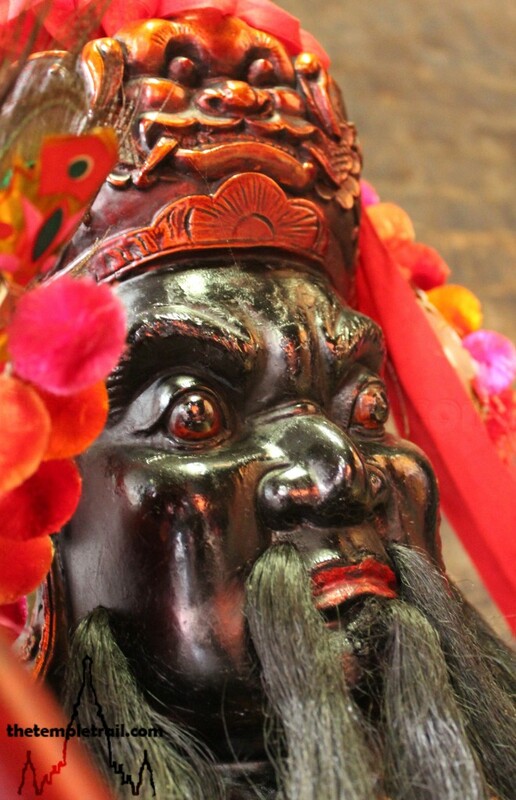 He is an ancient god who traces his origins back to the Shang Dynasty (1600 – 1046 BCE). The martial god is seen as an exorcist and protector from natural disasters. He also has a water god function in the southern parts of China. 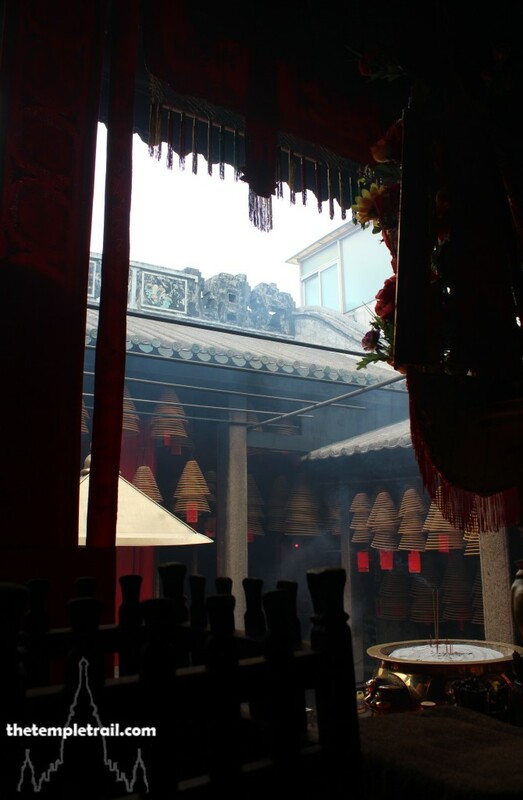 This temple was built in 1844, also during the rule of the Daoguang Emperor. From the plaza in front of the temple, you survey the façade. Once more, part of the temple has been reassigned for commercial purposes and the turquoise painted hall on the right now functions as a small local shop. Framed by another bright blue-green building on the left, the front of the temple is of grey brick, but highlighted with crimson daubings. The burning red duì lián either side of the front door say ‘In the morning Pak Tai lives in the golden imperial palace, while at night the jade-like heaven is surrounded by stars’, alluding to his residence in the palace of the jade void. Passing two large paper lamps, you enter the front of the temple that is a polar opposite to the one you just came from. The spirit door marks the end of the small roofed foyer and the main area of the temple is an open courtyard. The brightness of the space contrasts strongly with the darker cloisters that encircle it. Ahead of you, under a roof, three altars are decorated with banners and flowers. Circling a large offering table, you head to the altar on the right. This ‘palace’, the Palace of Hau Guang, is dedicated to Va Kuong Tai Dai (花光大帝 Huá Guāng Dà Dì), Great Emperor of Flowering Brightness, a fire god. Although he may trace his roots to the Qin Dynasty (221 – 206 BCE), the Ming Dynasty classic Investiture of the Gods (封神演義 Fēngshén Yǎnyì), says that he is the second son of the sister of the Jade Emperor, hence his alternate name Yi Long San (二郎神 Èr Láng Shén). He is, according to the book, the greatest warrior god of heaven. The god, who also appears in the great novel Journey to the West, sits next to Kam Fa (金花 Jīn Huā), the golden flower goddess. Moving on to the centre, you stand before the great Pak Tai himself and the statue of the Northern Emperor is guarded by two attendants on either side of him. The two bearded figures are made of clay and are unlike other such guardians. The armed warriors keep constant vigil over their lord. Passing to the left, you stand before the last of the three altars; the Palace of Kwan Tai. This is dedicated to Kwan Tai (關帝 Guān Dì), the god of War. In life, he was Guān Yǔ (關羽) a general of the Three Kingdoms Period (220 – 280 CE) who is hugely popular throughout the Chinese cultural sphere. 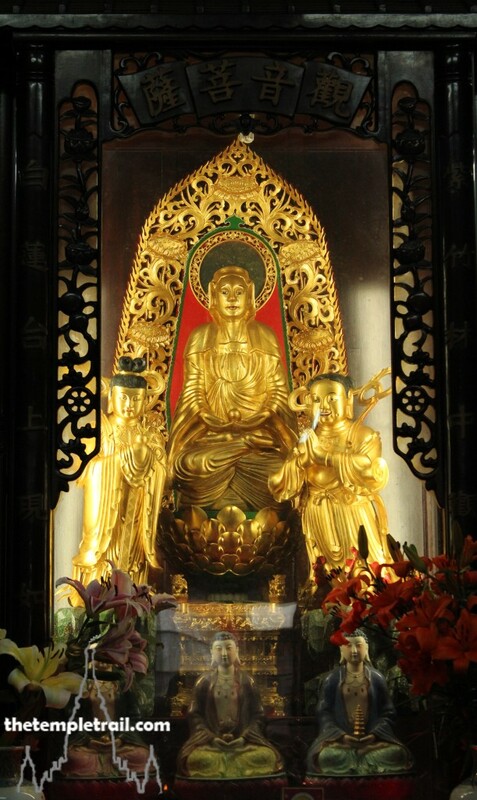 Before his altar you are warned by the presence of his two sworn brothers; the light skinned Lau Bei (劉備 Liú Bèi) and the dark skinned Cheung Fei (張飛 Zhāng Fēi). The two statues grimace at you and, despite their short stature, are no less fearsome. Heading back to the main entrance, you pass some small figures of a tiger, a snake and a cockerel. The tiger, symbolically a protector against evil, has an offering of pork fat and green beans draped across its head. 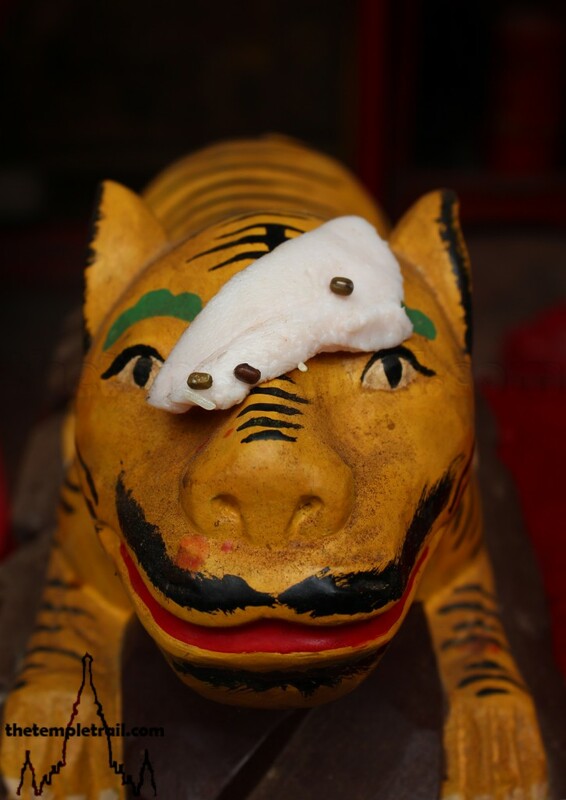 Although this one is orange, the rubbing and then placing of pork fat on the mouth of the white tiger is a ritual aimed at protection from evil spirits and demons, elimination of disasters and bringing of wealth. The White Tiger of the West (西方白虎 Xī Fāng Bái Hǔ), one of the Sei Joeng (四象 Sì Xiàng – four symbols of the constellations), is commonly offered pork fat, green beans, sesame seeds and duck eggs. As you make your way out, regretting a little that you didn’t have some fat to offer the tiger, you start to feel hungry yourself. Amid the warren of small alleyways, you search for a famed restaurant called Tai Lei Loi Kei. On what was once the edge of the village, the small, dark place beckons you in. You order the famous pork chop bun and after relishing the seasoned pork chop inside a sweet pineapple bun, you step back out on the street and towards your next stop. 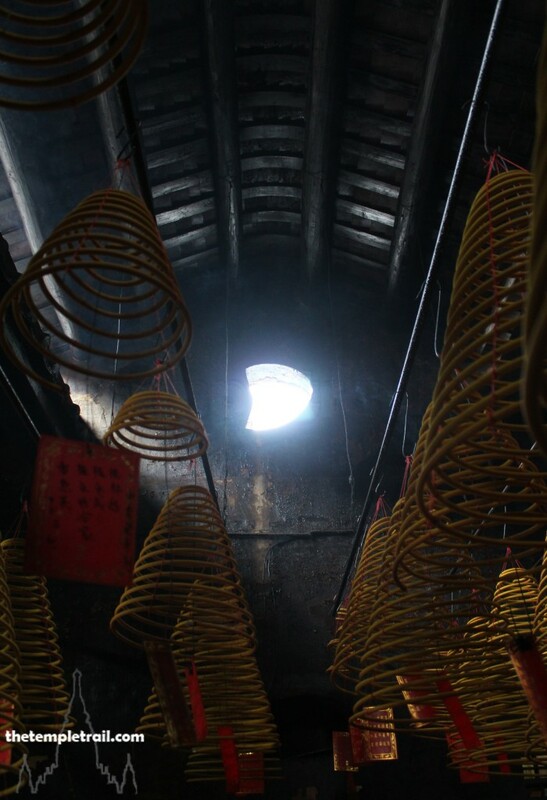 Energy reserves replenished, you bound along and soon pass a small temple to Kun Iam Temple. 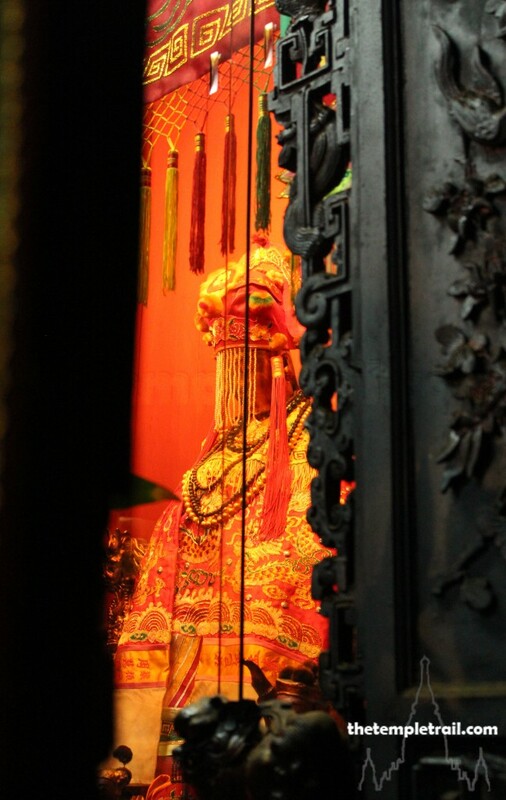 Kun Iam (觀音 Guānyīn) is the goddess of mercy and her golden image inside the dark hall has an almost elfin quality to it. Dipping into the small chamber, you pay respects to the beautiful image before moving on down the road. You next walk into the Ka Sin Tong (Auspicious and Benevolent House). The open courtyard terminates in an altar to the Emperor of Sacred Doctors. Also known as the Divinity of Medicine Temple, Ka Sin Tong dates from 1900. It is not technically a temple, but appears as though it is one. Originally it housed an early health NGO, although there are no records of this. The inscriptions inside the building state that it was built in the 20th year of the Guangxu Emperor (光緒帝 Guāngxù Dì). The statue of the Emperor of Sacred Doctors is a composite figure that represents various sacred doctors from throughout Chinese history. Chinese culture reveres doctors such as Huá Tuó (華佗), from the Eastern Han Dynasty and Sūn Sīmiǎo (孫思邈) from the Sui and Tang Dynasties. The ancient temple keeper keeps an eye on you and after a few moments of her penetrating stare, you decide to be about your way. Passing a small street shrine, local ladies burn offerings to their ancestors and local gods, filling the air with acrid paper smoke. Within minutes, you have cleared the miasma and stand before the unique Sam Po Temple. Sam Po(三婆 Sān Pó) means ‘Third Grandmother’. Sam Po is said to be the third eldest sister of Tin Hau, and a water goddess in her own right. She has been revered since the local people defeated the pirates in 1833 and her temple was built in 1845. 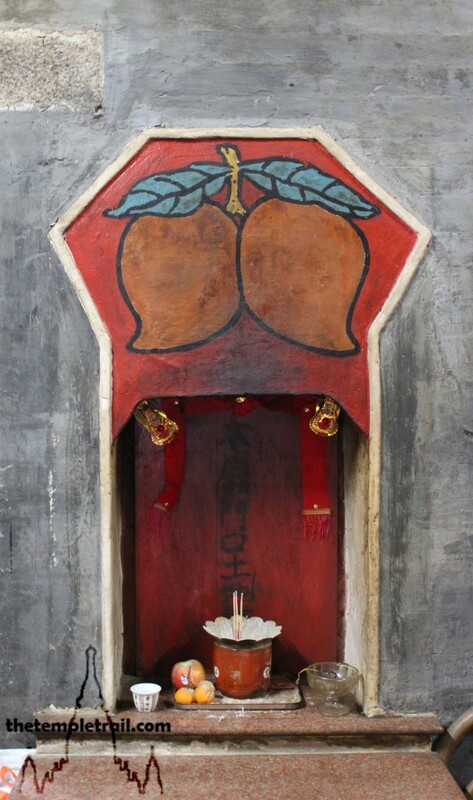 Framing the door, the red characters say ‘Her blessing is shown to the Kingdom of the Sea and her benevolence covers the River Land’. Entering the dark temple of the sea goddess, the two temple keepers eagerly gesture for you to make an offering. After dropping a few patacas into the box, you begin to explore the hall. On the wall to your left is a Taoist stone tablet that dates from the rebuild of the temple during the reign of the Xianfeng Emperor (咸豐帝 Xiánfēng Dì) in the 1850s. 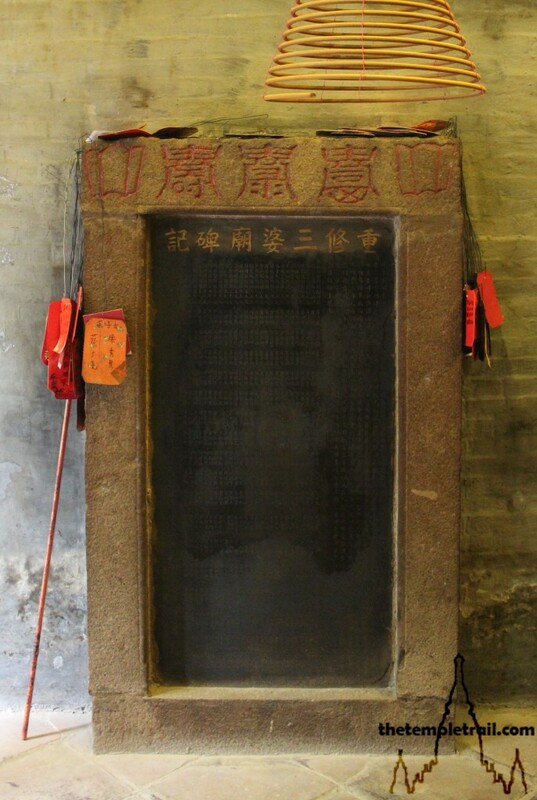 The stele is covered in writing, but the three Taoist characters on the stone frame are mysterious and add a touch of sorcery to the feel of the chamber. At the back, a huge boulder makes the rear wall. The temple was built onto the rock and carved into a small niche, is the central altar and its image of the goddess. As you approach, you see that the visage that peers out from the red framed hollow is jovial. Sam Po has a kind face and her demeanour makes you feel instantly comfortable. The flowers and fruit on the offering table make her altar area appear warm and motherly. After a few minutes in the presence of the local goddess, you quit her company and return to the streets of Taipa. As you wander towards a café and a chance to put your feet up for a while, you consider the religious scenery of this small fishing village. Before it was divorced from the sea, the settlement had a tiny population of seafarers. Despite the towering casinos that are springing up all around it, you still get the feel of the old Taipa. Busy little temples serving gods who look after sailors attended to by the local ladies as the men went to sea to bring back fish from the often unpredictable waters.